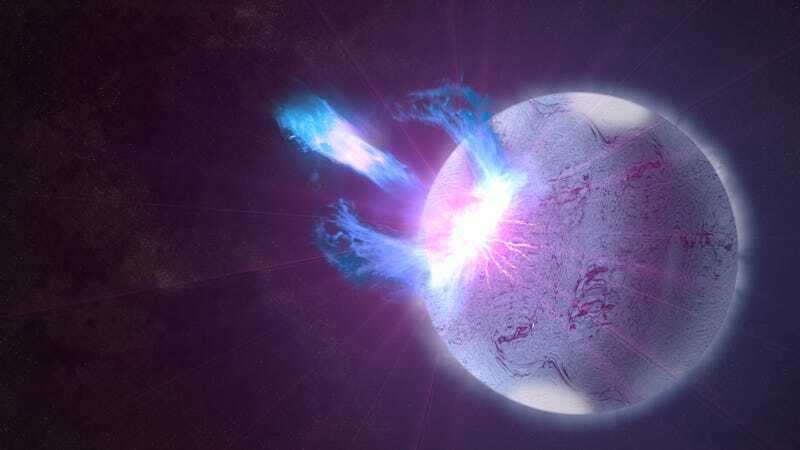 Artist’s depiction of a rupturing magnetar—a rotating neutron star with an extremely strong magnetic field. These exotic objects could be the source of the mysterious cosmic bursts observed by scientists. Canadian scientists have detected 13 new fast radio bursts, those mysterious, split-second, high-energy pulses that reach us from unknown origins billions of light-years away. Intriguingly, one of these newly documented bursts is a repeater, becoming just the second-known repeating fast radio burst among the 60 documented so far. First detected in 2002, fast radio bursts (FRBs) continue to mystify astronomers, who have struggled to understand the sources of these powerful emissions. FRBs last for just a few milliseconds, and their unpredictable displays make observations notoriously difficult. Incredibly, these radio waves originate from distant galaxies, traveling at high energies through the cosmos for literally billions of years. Popular explanations for FRBs include rapidly spinning neutron stars with strong magnetic fields (known as magnetars), mergers of highly dense objects, collapsed stars, supermassive black holes, and—much more speculatively—extraterrestrial civilizations. FRBs tend to be fleeting events, but a repeating FRB, named FRB 1211012, was detected by Puerto Rico’s Arecibo radio telescope in 2012. The discovery of a repeater was a huge deal because it meant that the source of this particular FRB, and possibly others, wasn’t the result of a cataclysmic explosion, but rather something that persists through time. Indeed, it’s still early days in our understanding of FRBs, but a pair of papers published today in Nature are offering tantalizing new clues about this enigmatic feature of the cosmos. The first paper describes 13 new bursts, of which one, described in detail in the second paper, is a repeater, making it the second-recorded repeater ever. The CHIME telescope in British Columbia, Canada. The new FRBs were detected by the brand new CHIME instrument, or Canadian Hydrogen Intensity Mapping Experiment, located in the Okanagan Valley of British Columbia. Launched in 2017, the project is a collaboration of Canadian scientists from the University of British Columbia, McGill University, the University of Toronto, the Perimeter Institute for Theoretical Physics, and the National Research Council of Canada. Remarkably, all 13 bursts were detected over a three-week span during the summer of 2018 as the astronomers were still bringing the system online, and while CHIME was operating at a mere fraction of its full capacity. Of the 13 new FRBs, seven of them were, unexpectedly, detected at 400 megahertz (MHz), the lowest radio frequencies measured so far for these bursts. FRBs are typically in the 1,400 MHz range, and the previous lowest radio frequency was at 700 MHz. CHIME is designed to detect FRBs within the 400 to 800 MHz range. The unexpectedly low 400 MHz frequency suggests FRBs might be detected at even lower frequencies, but another instrument would have to be used for that, as this is as low as CHIME can go. Also, as radio waves travel through space, they interact with the electrons and magnetic fields present in the interstellar and intergalactic plasma. These interactions, said Tendulkar, can cause absorption, scattering, and many other effects on the radio waves. These effects vary with frequency, and many of them become stronger at lower frequencies. It’s easier, therefore, to measure and understand these effects at lower frequencies. “By understanding these propagation effects and being able to separate them from the intrinsic characteristics of FRBs, we hope to be able to use FRBs as probes of the electron distribution and magnetic field distribution in the Universe which would tell us about how the Universe built up structures, such as galaxies, galaxy clusters, and so on,” explained Tendulkar. As for the new repeater, it’s called FRB 180814.J0422+73. The astronomers detected six repeat bursts from this single source, all originating from the same location in space. The source of this repeating FRB is located about 1.5 billion light-years from Earth, which is considerably closer than FRB 1211012, which was twice as far away. Importantly, the known population of repeating FRBs is now more than one, so we know that FRB 1211012 wasn’t some kind of anomaly. With this new discovery, astronomers are now hopeful of finding even more repeaters. Petroff said she wasn’t surprised the CHIME astronomers found another repeating FRB, but she was surprised they found it so soon. Petroff was also surprised that CHIME found so many FRBs so quickly. Given that 13 FRBs were detected in such a short amount of time using pre-commissioning data, “just imagine what’s waiting for us in the full-sensitivity data,” she said. Loeb said we now know of two repeaters out of about 60 known sources, which “implies that the repeater population is not negligible but also represents a small minority, less than a tenth, of the entire population of FRB sources.” While interesting, these new observations, he said, cannot tell us about the nature of these sources—at least not yet. Another interesting point to keep in mind, according to Loeb, is that the first repeater exhibited an associated persistent radio source at a frequency not observed in the new repeater. It would be helpful to figure out the nature and cause of this persistent source in the first repeater, “since it will likely shed light on the central engine of the FRB emission,” he said. Amazing—we’re very much looking forward to that as well.